Any News on Twitter Button Being Fixed? Anyone know when twitter will fix this or when the widget will be updated or ? Re: Any News on Twitter Button Being Fixed? It is not broken. Twitter made a business decision. Because of it, the numbers has been removed. Also the decision by Twitter affects all sites and forums, not just Forumotion. No the Twitter share button still works, but it will no longer count the amount of shares. Twitter decided to do away with this and removed it on their end. That was a bussiness decision made by them, so yes, unless they ever change their mind and put the count feature back on, the button will not count the shares anymore. 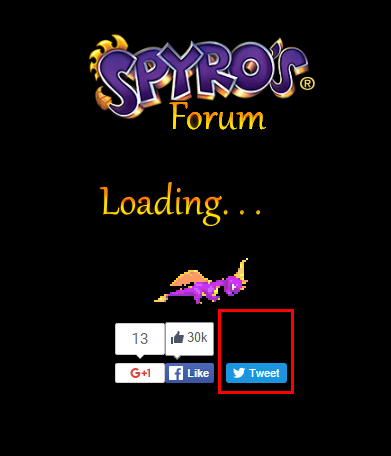 Thanks, I'm using this thread as a source for Spyro's Forum. Mostly , because when my haters see that, they randomly automatically assume its all fake social likes.